PULP! 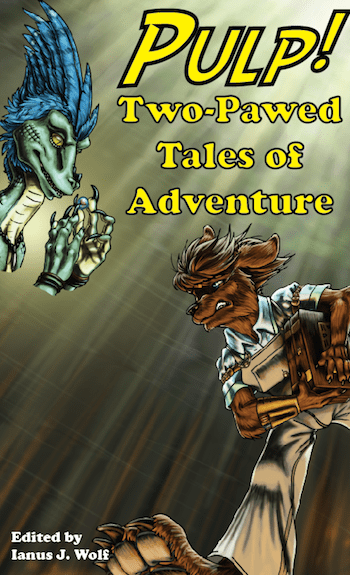 Two-Pawed Tales of Adventure – book review by Fred Patten. Las Vegas, NV, Rabbit Valley Books, September 2014, trade paperback $20.00 (255 pages). “The Pulps” were the rough-edged inexpensive, popular fiction magazines that were published from the late 1890s through the early 1950s, on the cheapest wood-pulp paper available. There were general-fiction magazines like All-Story and Argosy, and specialized magazines like Black Mask (mystery), Exciting Western (Western), Fight Stories (sports), G-8 and His Battle Aces (aerial warfare), Love and Romance (romance), Railroad Stories (railroad adventure), Ranch Romances (romantic Western), South Sea Stories (sea adventure), Thrilling Wonder Stories (science fiction), Weird Tales (horror), and many others. The 1920s to the ‘50s was also a period of similar weekly radio adventure-fiction dramatizations. Now Rabbit Valley Books has recreated that era, but with anthro animal casts. Editor Ianus J. Wolf presents eight stories as though they were episodes of “The RVO Radio Evening of Adventure”. PULP! Two-Pawed Tales of Adventure is a very mixed bag. Some of the stories are just standard adventure stories with funny-animal casts. (Boring.) Some seem to be standard adventures with funny animals, but the animal natures of the characters turn out to be pertinent. (Clever.) And some present a new kind of adventure designed for a furry world. (Admirably imaginative!) But it would be a spoiler to say which is which. “The Ruins” by Tym Greene is an Indiana Jones-type Amazonian adventure. Liam Felton, an experienced explorer (zebra), and Stewart Brace (Dalmatian dog), an inexperienced youth but the son of the company president who ordered the expedition, search through the South American jungle for the ancient Indian temple that holds the Secret of the Gods. An unscrupulous rival, Maicon Klauss (magpie), and his hulking henchman Bernard (Clysdale horse) are ahead of them. “Prey” by Ocean Tigrox is a Western. A nameless grizzled badger bounty hunter comes into a dusty Nevada town looking for a rabbit outlaw. “The rabbit could run but he couldn’t hide.” (p. 23) He finds that the whole town is hiding a more deadly secret. There are a vulture saloonkeeper, a bobcat mayor, an eagle sheriff and his hyena deputy, a cougar callgirl, a jackal clergyman, and more. I am bugged by stories that use the terms “rabbit” and “hare” interchangeably. “Rocket Canyon” by Bill “Hafoc” Rogers is a combination of a Western and a World War I adventure in which the Central Powers used a bioengineered plague that turned people into anthro animals, instead of poison gas. Or that’s what it seems to be at the beginning of the story. U.S. Marshals ‘Sharpears’ Chuck Blue (stallion) and ‘Alkali Creek’ Jim Smith (bear) find that the true situation takes on a World War II aspect as well. Kudos to Rogers for writing a German accent for Doctor Doctor [sic.] von Oberth that’s thick but not too thick for the reader to easily understand. “The Bouncer and the Didgeridoo of Awakening” by T. S. McNally is, as the title should indicate, an Australian adventure. Very Australian. The Bouncer is a female kangaroo who is after the magic didgeridoo that can reanimate the dead. Mix in World War II secret agents, and this adventure has lots of action that never slows down. “Tesla Mae and the Lost Tribe” by Renee Carter Hall features an English foxhound equivalent of Amelia Earhart, an adventurous 1930s aviatrix (but her airship is a zeppelin) who discovers an uncharted island inhabited by a tribe of feathered lizards. (Evolved dinosaurs?) What she finds there is not as interesting as the way that Hall tells it. This is definitely the best story in the anthology for fine writing, and I am not ashamed to admit that it almost left me in tears. Most of the genuine pulps never had a story this good. “Jericho Tanner and the Ebon Star” by Tarl “Voice” Hoch isn’t as beautifully written as the preceding story, but its mystery about Jericho Tanner, the narrator, an apparently immortal cat, will keep the reader wrapped in an eldritch Lovecraftian atmosphere with more hard-boiled action than Lovecraft ever put into his stories. “I was moving before my name had passed her teeth. The next sound out of her pretty little white muzzle was a scream. L. Sprague de Camp warned aspiring s-f writers in the 1940s to avoid creating unpronounceable names. Hoch’s “Kilij of Vla’ktr” surely qualifies, although I suppose that this comes with the Lovecraftian territory. Cthulhu fhtagn, and all that. “Savior” by Roland Jovaik starts out as another Western, but quickly turns into another Indiana Jones-type adventure. Regis is an old fennec homesteader. When the cats of a scar-faced leopard kidnap his granddaughter, Regis goes after them to find … but that’s the story. “Flight of the Fire Dragon” by Huskyteer flies into Dr. Fu Manchu territory. Rooi Randall (basenji) and Felicity Blake (caracal), two South Africans in the British Secret Service (South Africa was a British Dominion), are assigned in their red biplane to find a dragon that has attacked London. As they suspect, it’s a mechanical monster created by an old enemy. Despite which story being the “best” being a personal choice, I’ll confidently state that “Tesla Mae and the Lost Tribe” by Renee Carter Hall is definitely the top in quality here. Several others are enjoyable reading, and, as usual in any anthology, there are a couple that are very forgettable. The attractive cover by Robbye “Quel” Nicholson fits the theme but does not illustrate any particular story. That’s Tess?! I never would’ve guessed it. What I find more amusing is that at first glance it appears as if the character on the right is clutching a treasure with anger before a scaly villain who sneers maniacally. But when you read the story and understand the scene the picture is depicting, it is in fact, completely different. I understand my confusion now! I thought that Tess was a smooth-furred foxhound, and I never realized that the rough-furred “mutt” was her. Especially since the cover figure doesn’t look female at all. Gender stereotyping, I’m afraid. I would agree with the Renee’s being the strongest written story in the collection. I also assessed this when I initially read through this. I am flattered to have been put next door to it, quite honestly. What I found interesting about it is that there really was no major antagonist to the story other than the natural perils that can come from adventuring alone providing background tensions. However, the exploring of new places, and the discoveries of new people and being genuinely open to the realms of curiosity in exploring, it’s easy to place yourself into the adventurer shoes through the emotional climax. Another ending kind of just took me by a loop. The story went from a particularly somber tale that had a sense of mortality and vengeance to a kind of DragonBall Z/Martix Revolutions spectacle. Now, I don’t mind either kind of story, but the abrupt transition from one to the other kind of just made me jump out of the realm of immersion. As far as the collection goes I did enjoy it, and my biggest compliment on the way it was put together was the order. I do not know if this was purposeful or not, but they intertwined the action heavy stories with the adventure heavy stories so that there was breathing. Adventure, Action, Adventure, Action, Adventure, etc. Gabe Newell calls it, in the context of gaming, “battle fatigue”. Where there is so much action going on without proper pacing that a player tires out, so you give a sequence that allows them to pause. Interestingly the order of the stories here had that sort of structure. As far as my own story goes. It’s still my favorite ‘child’ in my handful of short stories that have been published. Mostly because of just how well the pieces of the puzzle fell together. How a simple handful of items that I had originally wanted to be there became a very deep read into Australian history and for the most part, the events and scenes were very much in the state depicted within the story, and worked to the story’s benefit. The creation of the story, was a story within itself. I could remember the trials and tribulations on trying to get the history to mesh with the traveling characters. Lots of daring close calls with the unforgiving facts of history. I was fighting my own battles as well, but I had challenged myself to be grounded in some sense of historical accuracy (minus the dead raising Didgeridoo of course). It made me more proud when in the end it had worked out and made it a more memorable writing trial for me. I have read a fair bit of World War II history, and I liked the way that you blended genuine Australian-theater history into your story.